This past week I have gone out to enjoy the beautiful weather just about every day. Thursday was sand sculpting at the beach, Friday was the beach and do some thrift store shopping with the girls, Saturday was Strawberry Picking at Cider Hill Farm, and Sunday was church and hanging out in the backyard. I love smoothies!! They act as a way to get fruits and vegetables in your diet. They replace a meal. And..they cool you down from the heat. I actually had this smoothie at a local organic cafe and it was awesome!! I knew I could make it myself…So here we go! 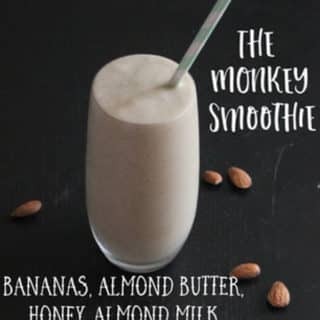 Bananas, Almond Butter, Almond Milk, and Honey all blended up for a divine treat! After I made this smoothie I started singing “Do the Monkey” by The Wiggles. Laugh at me if you want, but for my fellow momma’s out there, you get it. The almond milk- I actually found this at Aldi with no Carrageenan in it! 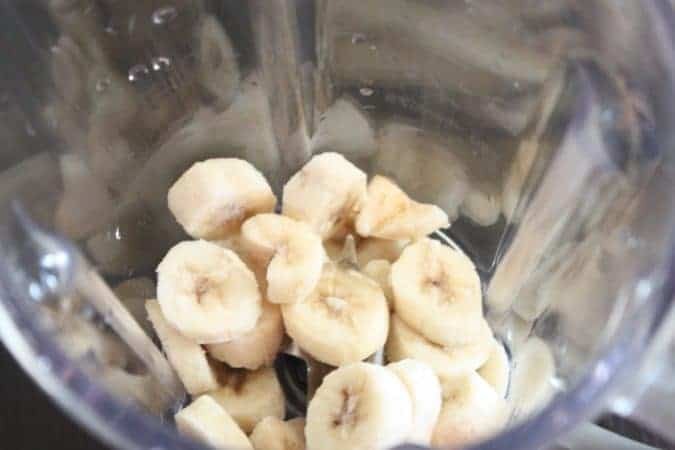 Bananas-When I first made this smoothie I had bananas chopped up and placed in the freezer because they were starting to get bad. You do not need to do this when it comes to preparing this smoothie, you will blend two bananas with 1 cup of ice. I have been making this treat in the morning as my breakfast with a sprinkle of cinnamon to help boost my metabolism. Frozen bananas blended together with honey, almond butter and almond milk. A quick and easy breakfast or anytime snack! Blend all ingredients in a blender until smooth! Enjoy! This smoothie is great! Thank you for sharing! I loved this smoothie with my protein powder! Very good! I’ll be making this one again.